January 2011 ~ I Can Do That! I love watching America's Test Kitchen. They do all the work for you and always come up with recipes and cooking tricks that are interesting and helpful. 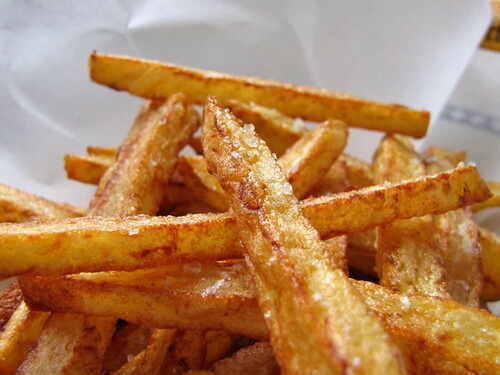 One such recipe is the easier to cook 'crispy on the outside, creamy in the inside' French fries. And it really is not complicated at all. The secret to the crispiness is adding uniformly cut [into batons] Yukon Gold potatoes to room-temperature oil instead of preheating the oil. Once the oil and potatoes start boiling [over high heat], the potatoes are cooked without stirring for 15 minutes. After 15 minutes, the chips are separated with tongs and cooked for another 5 to 10 minutes until golden brown and crispy. I love it sprinkled with flaked sea salt and dipped in malted vinegar. The January 2011 Daring Bakers’ challenge was hosted by Astheroshe from the blog, accro. She chose to challenge everyone to make a Biscuit Joconde Imprime to wrap around an Entremet dessert. Wow! I've never made a cake as elaborate and labor intensive as this one. It took me almost half a day to prepare, bake, and assemble this easy-on-the-eyes and delicious dessert. Thank you Astheroshe for a choosing an exceptional challenge. I enjoyed every minute I spent making and every bite of this wonderful cake. I followed the recipes for biscuit joconde and decor paste without any changes, except I only made half a recipe of decor paste. 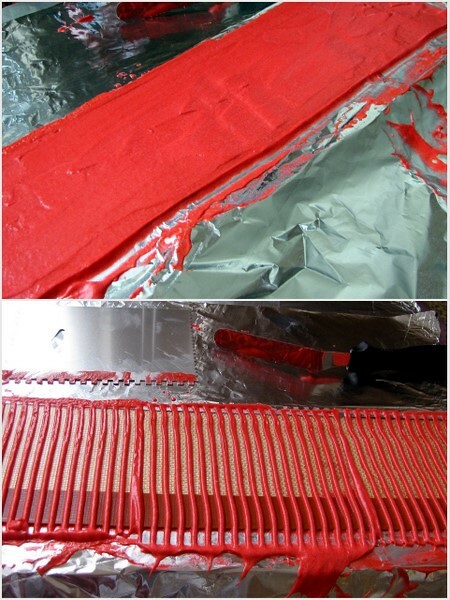 I added 1 whole tube, about 1½ tablespoons, of gel food dye to the decor paste to achieve the intense red color. I used a metal pastry comb to create the pattern on the decor paste which had to be frozen to prevent it from leaking into the biscuit joconde batter. Since my freezer is not big enough for the size of a half-sheet pan, I left it outside (25°F) until the decor paste firmed up. I placed the silpat inside the pan before spreading the joconde batter evenly on top of the frozen decor paste all the way to cover the sheet pan. It took just 7 minutes to bake the cake which was immediately flipped onto a parchment paper. 1½-inch thick strips were cut to fit an 8-inch round springform pan (bottom removed and flipped) lined with parchment paper. Parchment paper is not the best thing to use for this kind of dessert because it bends and creates creases on the mousse. 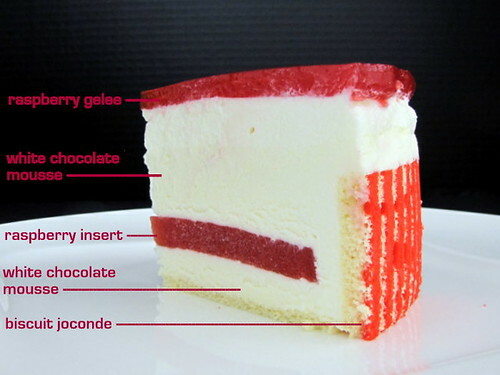 I would use an acetate sheet next time I make the cake. I made a mistake and did not fill the bottom with enough mousse before putting the raspberry insert and added too much on top by about half an inch; and the raspberry gelée should be thinner. Well, next time I'll try to do better, I hope. It takes a lot of patience to build the entrement cake dessert but I will definitely be making it again. Yes, definitely. 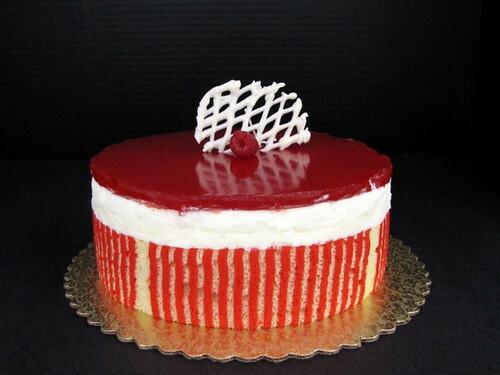 The inspiration for the design and white chocolate mousse and raspberry combo filling comes from my cookbook ADVANCED BREAD AND PASTRY by Michel Suas. The mousse is light as feather, not too sweet, super delicious, and perfect with raspberry. Sprinkle gelatin on water to soften; set aside. Melt chocolate, set aside. Whip heavy cream to soft peaks, set aside. Make a crème Anglaise with milk, vanilla, sugar, and egg yolks. Strain through a fine sieve into a bowl, add the gelatin and stir until well combined. Add the melted chocolate and stir until emulsified. When the mixture has cooled to 80°F, fold in the whipped cream. What savory or sweet food would you like to have on your birthday? This was KCC's challenge for this month. It's kinda tough because there are too many dishes to choose from (noodles: palabok, canton, guisado, lasagna, spaghetti with tomato and meat sauce) and I'd rather have lots of sweets and desserts (cakes: mocha chiffon, chocolate, ube, sans rival; ice cream: cheddar cheese, ube, langka, coffee with mangosteen preserve; and leche flan, of course). I chose to feature Coffee Ice Cream with Mangosteen Preserve, my all-time favorite dessert since it was first introduced in the 80s by Magnolia. I can't remember when and why the flavor was discontinued by the company. About 6 years ago, I started making mangosteen preserve from tinned mangosteen. The fruit preserve is simple and easy to prepare at home. I spoon a large dollop on top of store-bought or homemade coffee ice cream and I enjoy this flavor whenever I want but most specially on my birthday. To make: boil the syrup from 2 cans of mangosteen with 6 tablespoons sugar until almost caramelized, add the fruits, separated into sections, and cook until thick and dark brown in color. Thank you Tressa and Jen for hosting this month's challenge. 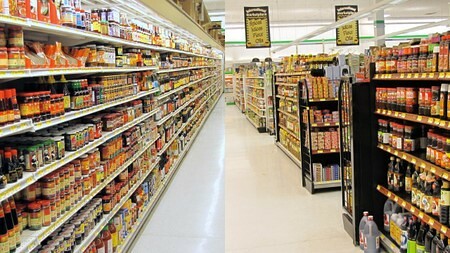 Our January 2011 Challenge comes from Jenni of The Gingered Whisk and Lisa from Parsley, Sage, Desserts and Line Drives. They have challenged the Daring Cooks to learn how to make a confit and use it within the traditional French dish of Cassoulet. They have chosen a traditional recipe from Anthony Bourdain and Michael Ruhlman. 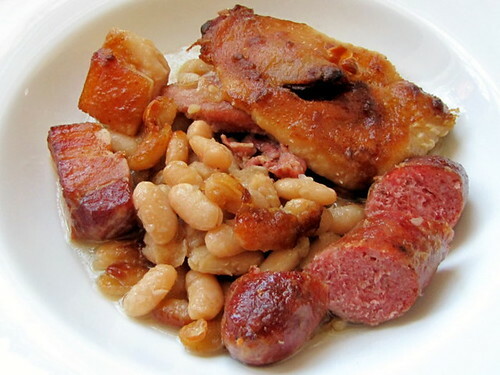 I have seen cassoulet in my cookbooks and several blogs but never cooked nor tried it before. Thanks to Jenni and Lisa for choosing cassoulet and Anthony Bourdain and Michael Ruhlman's recipe for this month's Daring Cooks challenge, now I have and can say this is an amazingly delicious bean stew. It was easy for me to decide to make this seemingly intimidating dish as I already have most of the ingredients such as duck legs confit, which I made last month following Michael Ruhlman's recipe, pork belly, pork rind, sausages (with thyme and sage), and herbs. The only ingredient I had to get from the store was the dried cannellini beans. Making the dish is a bit involved but it's all worth it. The beans absorbed all the flavors and fats from the meats and they tasted even better the next day. Strain the beans and the rind and set aside, reserving the cooking liquid separately. In the sauté pan, heat all but 1 tablespoon of the duck fat over medium-high heat until it shimmers and becomes transparent. Carefully add the sausages and brown on all sides. Remove sausages and set aside, draining on paper towels. In the same pan, over medium-high heat, brown the sliced onions, the garlic and the reserved squares of pork rind from the beans (not the unused pork rind; you'll need that later). Once browned, remove from the heat and transfer to the blender. Add 1 tablespoon of the remaining duck fat and purée until smooth. Set aside. Preheat the oven to moderate 350ºF. Place the uncooked pork rind in the bottom of a deep ovenproof non-reactive dish. You're looking to line the inside, almost like a pie crust. Arrange all your ingredients in alternating layers, beginning with a layer of beans, then sausages, then more beans, then pork belly, beans, duck confit and finally more beans, adding a dab of the onion and pork rind purée between each layer. 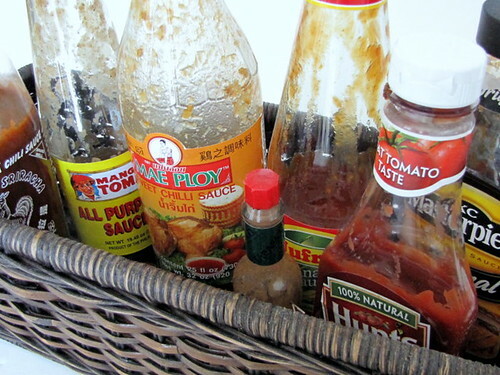 Add enough of the bean cooking liquid to just cover the beans, reserving 1 cup in the refrigerator for later use. 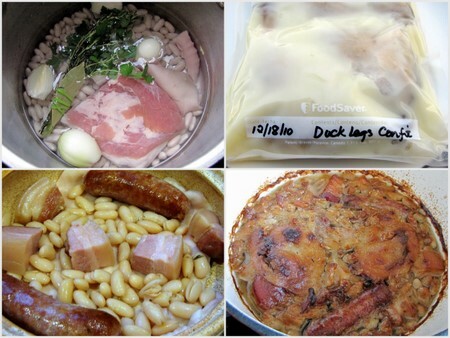 Cook the cassoulet in the oven for 1 hour, then reduce the heat to very slow 250ºF and cook for another hour. Remove from the oven and allow to cool. Refrigerate overnight. Preheat the oven to moderate 350ºF again. Cook the cassoulet for an hour. Break the crust on the top with the spoon and add ¼ cup of the reserved cooking liquid. Reduce the heat to very slow 250ºF and continue cooking another 15 minutes, or until screamingly hot through and through. The complete recipe including how to confit duck legs is here. 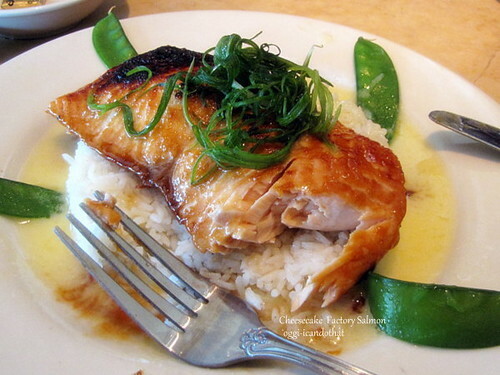 I went for the first time to Cheesecake Factory for lunch yesterday and had Miso Salmon with Sake Butter Sauce, a large enough salmon fillet broiled and served on a bed of rice, surrounded by a shallow moat of sake butter sauce, and garnished on top with finely shredded scallions. The plate is also garnished around with snow peas. I didn't know it is one of their most popular entrees and it's easy to understand why. It is delicious and I love it! So I went to the store before going home and bought salmon steaks. I cooked them today following the widely available recipe online. The salmon dish tastes almost exactly like the restaurant's. Delicious! Prepare Salmon: Preheat broiler. Whisk together sugar, soy sauce, miso, and hot water. Brush a shallow baking dish with oil and place the fillets on the dish. Spoon miso mixture evenly over fish. 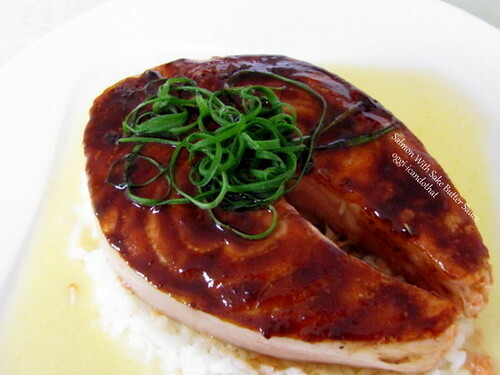 Broil 10 to 12 minutes or until fish flakes easily when tested with a fork, basting twice with miso mixture. Prepare the butter sauce while salmon is cooking. Prepare the Sake Butter Sauce: In a small saucepan over medium-high heat, saute the ginger and shallots in one tablespoon butter for two to three minutes. Add ½ cup of the sake, bring to a boil, and reduce by two-thirds, approximately three minutes. Remove ginger and discard. Puree with a hand-held blender if desired. Add the heavy cream, bring to a boil, and reduce by half. Add the cold butter to the sauce, one piece at a time, whisking constantly over medium-high heat until emulsified and sauce is thick and creamy. Once all the butter has been incorporated, remove the pan from the heat. Whisk in the remaining one teaspoon sake and the lime juice. Season to taste with salt. 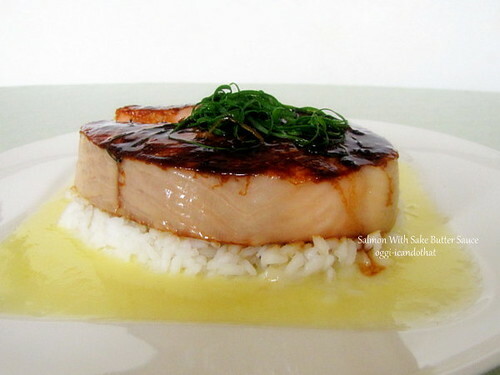 Plate the Salmon: Using a 5-inch mold, press a half-inch thick rice on a plate. Spoon sake butter around the rice. Place a fillet on top of the rice. Garnish top of the salmon with blanched scallions. Serve immediately. Now, about the wheat bread. Last year I made a copycat from online recipes without having tasted it. I can now say the bread I baked is pretty close to taste and texture although mine is not as sweet. I think the CF whole wheat baguette doesn't have rye flour though, but I'm not too sure. Anyway, I liked it so much I just had to buy a whole loaf to bring home. 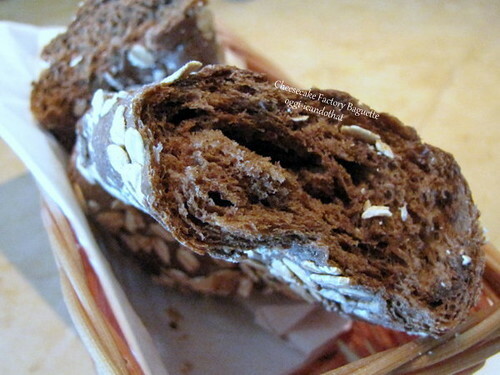 The whole baguette is about 2½ feet long and costs $3.45. I love its soft sweet crumb and the slightly chewy crust and the crunchy oatmeal coating is definitely a plus. Does anybody have a recipe for these peanut kisses from Bohol? My husband got these from the Philippines about 3 years ago and I have been searching for the recipe for a few years now but haven't been able to find one that makes cookies with similar texture. After baking many experimental batches using dozens and dozens of egg whites, I can say I'm not successful at all. They came out too flat or too puffy like the peanut meringue below. Can you tell I'm obsessed? I eventually gave up when I saw them here and bought 5 boxes. They are so yummy, crunchy, peanuty, and the best thing is, they aren't very sweet. Totally addicting!